It’s my Dad’s birthday and this is his birthday cake! I’ve been planning it for a while and I’m so pleased with how delicious it turned out. 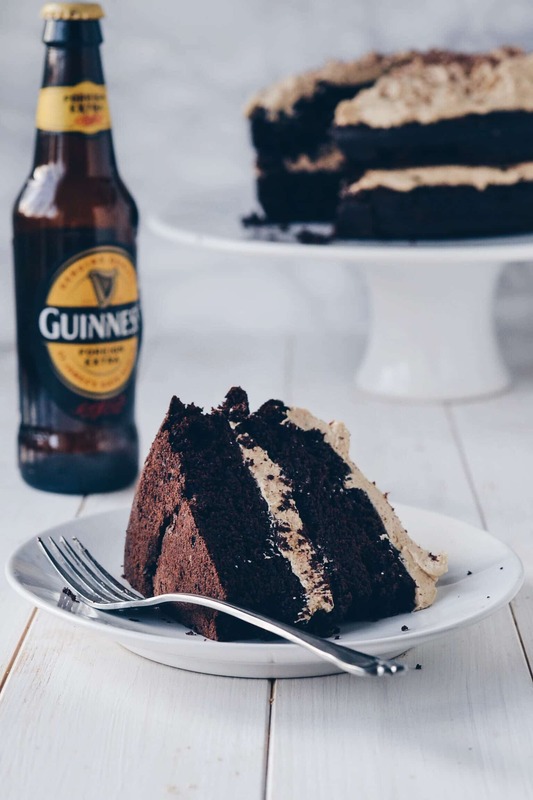 It’s an intense chocolate-y and stout-y cake with an amazing “Baileys” buttercream frosting. The frosting was inspired by my vegan Irish Cream Ice Cream which uses Irish whiskey, a little bit of cocoa powder and a little bit of coffee to recreate the flavour of Baileys. You wouldn’t know the difference! And the cake itself is slightly adapted from a recipe I found over at Fat Girl Trapped in a Skinny Body. Apparently Guinness isn’t (generally) vegan but there is a vegan option; Foreign Extra Guinness. It’s a lot stronger and more bitter but I think it works better in this cake as the flavour comes through a lot more. I was able to find it in my local supermarket but you can also purchase it online or use another vegan-friendly stout. Preheat oven to 170c / 350f. Grease and line two 8 inch sandwich tins. In a bowl sift the flour, baking soda, cocoa powder, salt and sugars. Make a well in the centre, pour in the beer, oil and vanilla. Whisk until there are no lumps. Pour into the prepared tins and bake for 25-30 minutes, until a cake tester comes out clean. Once baked, let them cool for 15-20 minutes in their tins before transferring them onto a cooling rack. To make the buttercream, cream the vegan butter and vanilla extract together in a stand mixer. Add the icing sugar in a large tbsp at a time until well mixed. Beat in the whiskey, cocoa powder and brewed coffee. Taste and adjust quantities if needed until it tastes just like Baileys! Once the cake has completely cooled, spread the frosting on top of one layer, sandwich the two layers together and then top the cake with the rest of the frosting. Serve and enjoy! It will keep in the fridge for up to 3 days, covered. Guinness on draft has been fish bladder free since 2016 and as of January 2018, ALL Guinness in cans/bottles is as well. Will be hanging with my vegan sister on St.Patty’s Day. 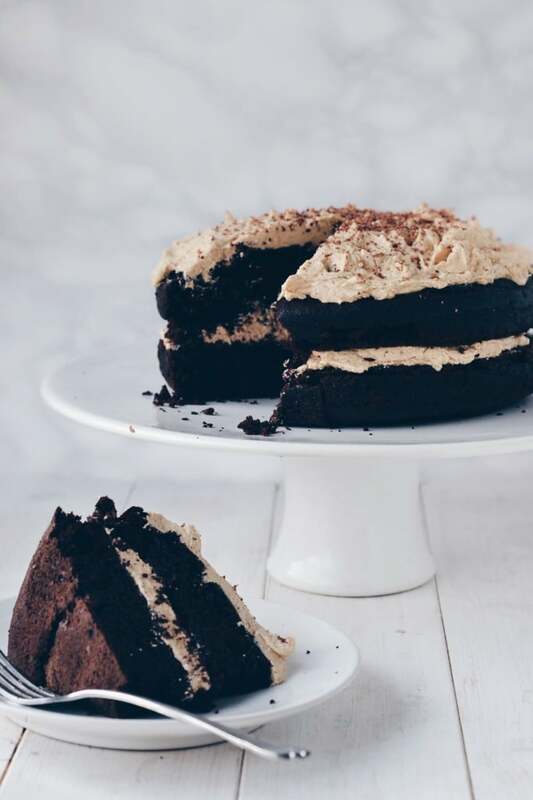 I think I’ll try this a single “poke cake” with the Irish Cream recipe from Oh She Glows. What is caster sugar, btw? Most amazing cake and so easy! All my friends who tried it were amazed with how lovely it was!! So happy to hear that, Victoria!! Thank you for this recipe! This is one of the tastiest cakes I've had, and the birthday girl it was made for was very pleased. I did 1.5 cups stout, .5 cups strong coffee, and did a peanut butter frosting. I made this cake last night and it turned out very good. You can taste the Guinness and it is very moist. Thanks for sharing this. I have never heard cake pans being called sandwich tins before. I assume you meann regular 8inch round pans?? Loved the flavor of this cake and the frosting! I must have done something wrong, though, because my cake came out dry and crumbly. It even broke on half when I turned it out onto the cooling rack. Frosting saves everything, though, so I made a little extra and glued it together that way! 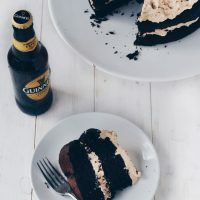 As she mentioned in her article, there is NOW a vegan option for Guinness. Thank you very much for this recipe. I have just made it ready for the weekend. I am sure that my menfolk will really enjoy this, as will I! Hi Amee, this cake is to die for, I've made it many times now and it's has become our favourite chocolate so far. so thank you very much for sharing this yummy recipe! Would you know if I could replace the plain flour with splelt flour?? Thanks!!!! Hi Esther, thank you so much for your comment! Glad to hear you enjoy it as much as I do :-) I have started using spelt in place of plain flour a lot now but find you may need a bit more of the spelt flour in certain recipes. Perhaps an extra 2-4 tbsp in this one? Let me know how you get on! This looks lovely - am going to try to make it tonight as a friend has requested this combo... (will be using a chocolate stout, not Guinness). Is it baking powder or soda? The ingredient list says powder, but instructions say soda. Thanks! What a great cake for your dad! He must have been very happy. Hope you're having a great holiday season. Hi Aimee, I thought I'd stopped by your blog before, but it was Ala (WallFLOUR Girl)'s site instead. And yay for discovering another UK baker. 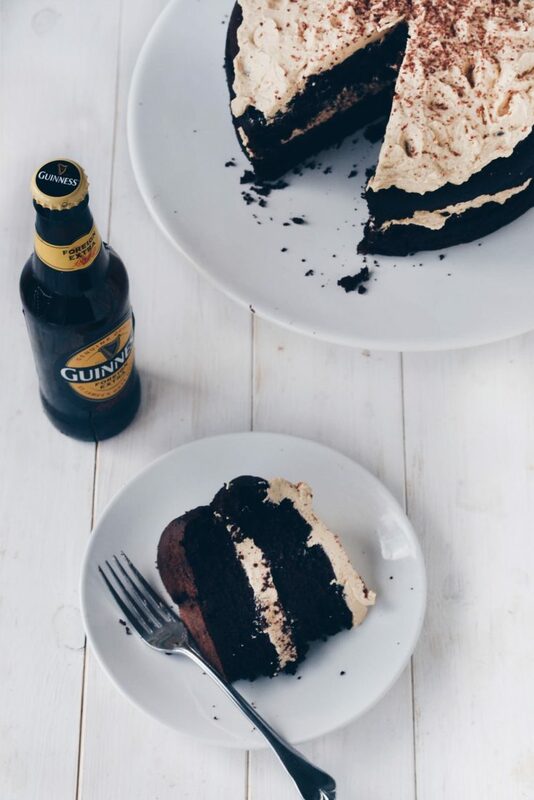 :) Absolutely love your Guiness cake. It looks amazing, and love the pairing of the Irish 'Baileys' Cream frosting too. I think I'd run to the corner and I'd snaffle this cake alone. Looks beautifully dark and delicious Aimee. Shame I can't eat Guinness!! Happy happy birthday to your dad, Aimee! This cake looks amazing and is the perfect celebration cake! The guinness just makes this so much more special - love it! Yum, I'd just love a big bowl of that icing. It's been way too long since I've whipped up something boozy in the kitchen, Aimee. This looks so perfect--vegan cakes are so incredibly moist and wonderful, too! Happy Monday! You've done it again, I've fell completely in love with this cake. I don't follow a vegan diet but I don't think I'd even unvegan it because it looks perfect. Aw, thank you Laura :-) I didn't mention to anyone it was vegan and no one could tell otherwise! Hate to break it to you, but Guiness is not vegan. Isinglas, also known as fish bladder, is used in the brewing process.